College football kickoff: Bulls, Gators clobber overmatched opponents; ASU doesn't get another big opening upset. Every year, I swear I'm going to give up on college football. Too many things are too predictable, like my alma mater South Florida having a three game losing streak after knocking off two pre-season top ten teams (Auburn and West Virginia) and attaining the number two ranking in the AP and USA Today polls last season, then progressing to a miserable drubbing in a minor bowl game. However, there are the wonderful unpredictables, like Appalachian State beating what proved to be an overrated Michigan team in their opener last year. The boys from Boone couldn't pull off another big opening game upset this year. ASU was mauled, 41-13, by the LSU Bayou Bengals in a game at Baton Rouge that had its kickoff moved ahead from 4 P.M. to 10 A.M. because of Hurricane Gustav. Meanwhile, the Wolverines suffered another opening day defeat, though this time to a more highly rated opponent, Utah. My USF Bulls romped over the Tennessee-Martin Skyhawks, 56-7, thereby breaking a pattern of struggling in their opener against a lightly-regarded opponent, and not jeopardizing their pre-season ranking of 19th. The Florida Gators, ranked fifth going into the fray, routed Hawaii by 56-10. The Rainbow Warriors, who have had some success moving into the ranks of college football's elite in the past few years, were not the usual sort of pushover Florida has scheduled for its opener. Given that fellow Southeastern Conference team Georgia has a pre-season rank of number one, while LSU and Auburn, both of which won today, are seventh and tenth, respecively, this may be an indication of just how tough the SEC is these days. On our recent visit to Maine, we stayed with my wife's cousin, Lori, in her house at Cape Elizabeth, near Portland. My second morning there, I was wishing I could do my usual Brooklyn Bridge walk, then remembered that there was a bridge not far away. It wasn't a beautiful suspension bridge, but rather a utilitarian concrete arch with a drawspan near the center, crossing the Fore River estuary from South Portland to Portland. So, I set off northward on Ocean Avenue, turned left onto Broadway, then bore right onto the bridge's pedestrian walkway. 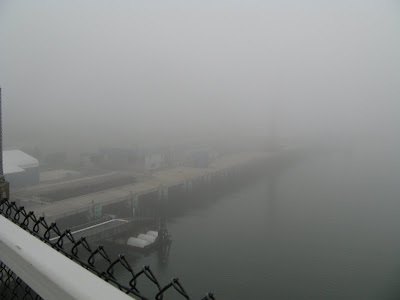 It was a foggy morning, so my view was limited to about a hundred yards as I set out across the bridge. 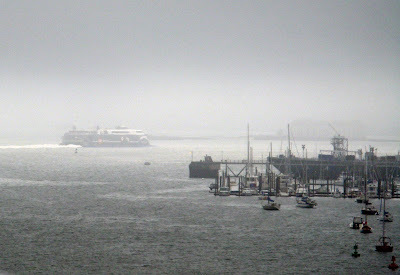 As I approched the Portland side, the fog had lifted enough for me to make out the docks below. Here the concrete of the bridge walkway gave way to the cobblestones of the city sidewalk. As I walked back across the bridge, I heard the roar of a motor below. 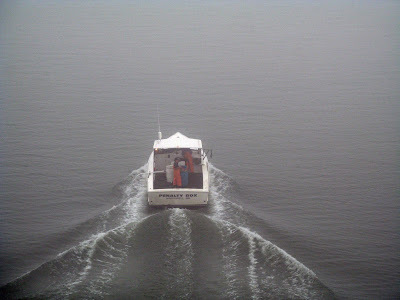 Looking down, I saw the lobster boat Penalty Box headed toward Casco Bay. On the way across, I had noticed a ramp coming up to the walkway just before the bridge crossed the south shore of the estuary. 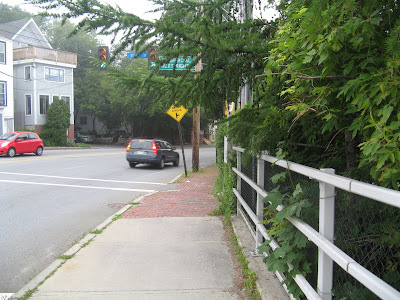 Coming back, I went down this ramp, which proved to lead to the foot of Ocean Avenue, thereby cutting about a quarter of a mile, and an unpleasant stretch above a wastewater treatment plant, off my return. 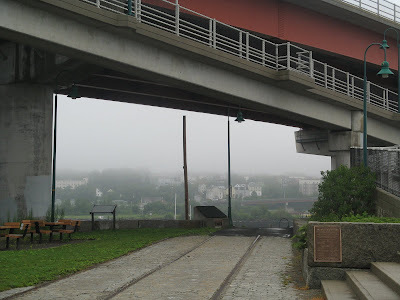 At the foot of the ramp was a small park, and railway tracks that led to what must have once been a carfloat dock. 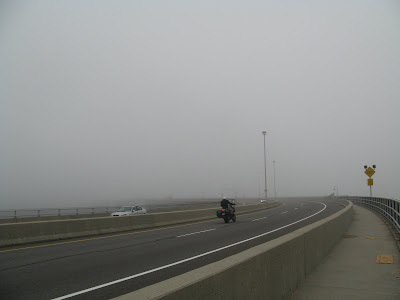 The following morning, the fog wasn't quite so thick. 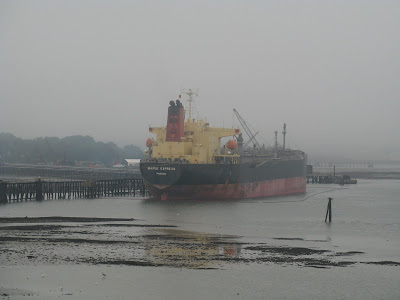 I found the tanker Maple Express, of Panamanian registry, docked on the South Portland side of the estuary, just west of the bridge. 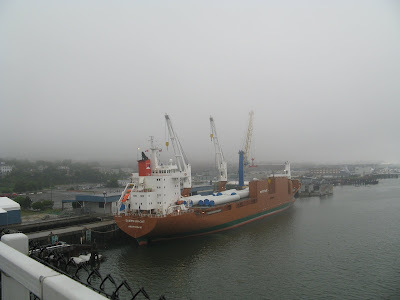 The Dutch freighter Sampogracht was docked on the Portland side. The metal cylinders on her deck look much like the sections of wind turbine tower on the deck of Marlene Green, seen at Eisenhower Lock two days later. 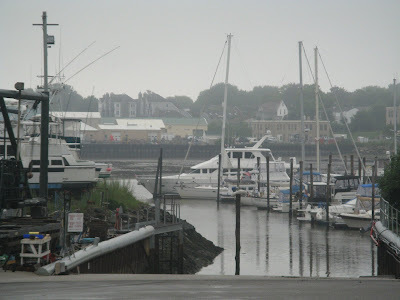 On my reurn leg, I saw The Cat, the big passenger and car carrying catamaran ferry that runs between Portland and Yarmouth, Nova Scotia, heading out toward the Gulf of Maine. 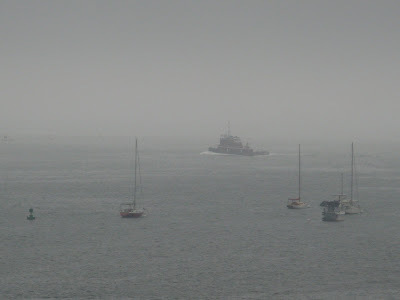 A few minutes later, the clouds had gathered as this tug sailed into the harbor. After I descended on the ramp from the bridge, things became a little brighter again, as seen in this shot of a boatyard and marina in South Portland.